Born in Baku, Azerbaijan, Garry Kasparov won the world championship in 1985 in one of five titanic struggles with Anatoly Karpov. He was finally defeated by Vladimir Kramnik in a 2000 match. Kasparov’s tournament results during his peak, from the mid-1980s into the 21st century, were equally impressive. What moves him to the head of this list is the fact that he was so much more active than the majority of his predecessors. No one else demonstrated his or her superiority so convincingly so often. Kasparov entered only the very strongest tournaments and routinely won them. Only Karpov could challenge him — and because Karpov is also one of the ten best players of all time, this restriction only adds to Kasparov’s résumé. The two players were fierce combatants in what must be considered the greatest chess rivalry of all time. 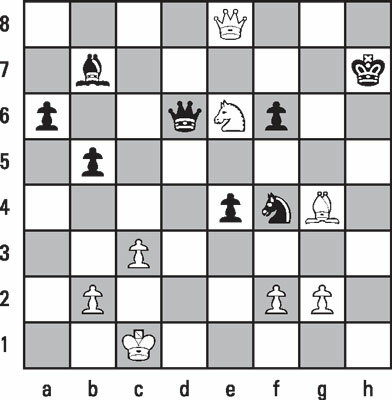 The game position here shows Kasparov in action in 1994 against his younger rival and eventual conqueror, Russian grandmaster Kramnik. 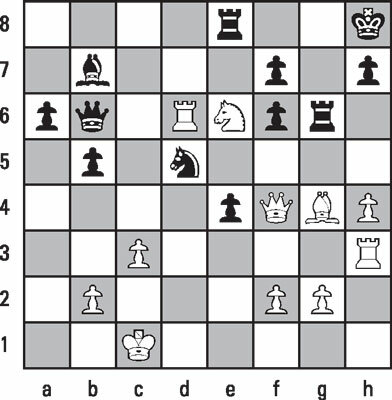 Kasparov ignores the attack against his queen. Kasparov ignores the attacks on his major pieces and pushes a lowly pawn! In his mind’s eye, Kasparov has seen that he can force a winning position by disregarding threats that would dominate the attention of lesser players. Black is a full queen ahead. At this point, Kasparov could have drawn by perpetual check with 30. Rg7+ Kh8 31. Rh7+, and so on. But he foresees much more! Black actually resigns before white can play 31. fxe8Q (see figure), because black has no adequate defense to the threat of 32. Qf7+, with checkmate soon to follow. Kasparov’s attack is still underway.